Wooden adjustable bed with high quality Reflex mattress removable washable cover. 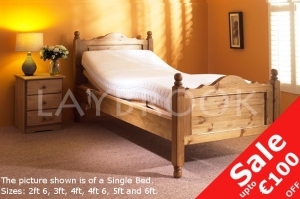 Standard size for the Barden is 23 inches from the floor to the top of the mattress. The length of the bed is 7ft 1". However, this can be made shorter (additional costs apply). If you change the specification of the bed it will be a special order (non stock item) and will take upto 1 week longer to make and deliver.